So here's the info of the first of 2 new projects that I have started. You know me, I just can't say NO to good material. And let me just say from the start, that HELL's NAZIS is not just a good yarn..
Its a bloody corker of a tale. Hell's Nazis is a rip snorting WW2 romp in the comic style of that great British comic, Warlord. I'm having a ball drawing it, it's got everything that I like to draw and John has even included a couple of extra touches, as a treat for me, I'm not going to say too much about it but, I will mention; sewers and tentacles. What a nice obliging man he is. So it'll be 10 pages, split into 2 parts and will be published in AccentUk's next zombie anthology. (oh yes, there's going to be a sequel to the well received Zombie's book). 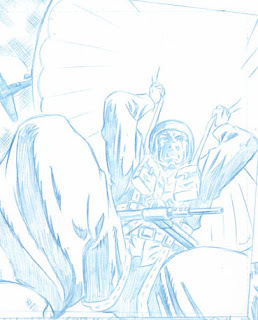 Here are a couple of panels from the 1st part of Hell's Nazis. 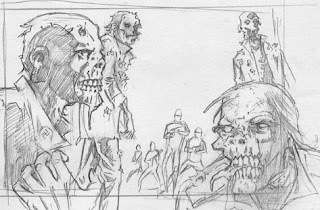 The commando is from page 1 and the zombies ( well it's going in a zombies book so you gotta have zombies) is from page 2. I'm taking my time over this, savouring it in fact, (and I am working on another project at the same time remember, that'll I'll mention soon) so don't expect too many updates on this in the near future. John and I have a specific look we want for this so I want to get everything right. Ok that's it for now, next time Project No 2. Me? Obliging? Why that's very kind of you, though the bits you suggested compliment the tale rather well! 10 pages? Are you going to do the you-know-what for each part then? Cheers Paul. I've got a specific look in mind for this. I just hope I can pull it off. I thought if we want to do this it how we planned, and get that full WOW effect, then the two extra pages are needed. zombies, nazis and gary crutchley, a match made in heaven - and hell! Shane, yer not wrong. having a blast drawing this. Keep on plugging away dude. I'm always impressed by folk who can use these evil pc's to produce comic pages.